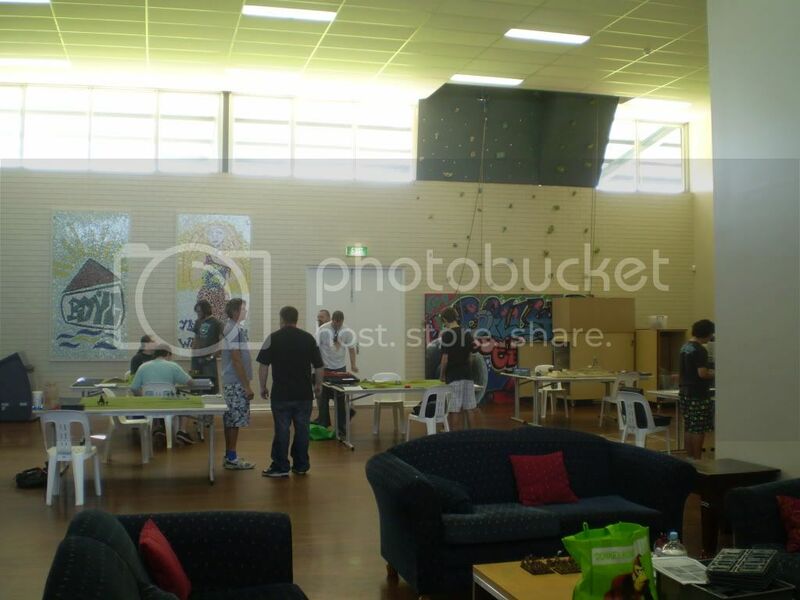 PAGS (short for the Peel Adventure Gaming Society) is the Mandurah venue for gaming. 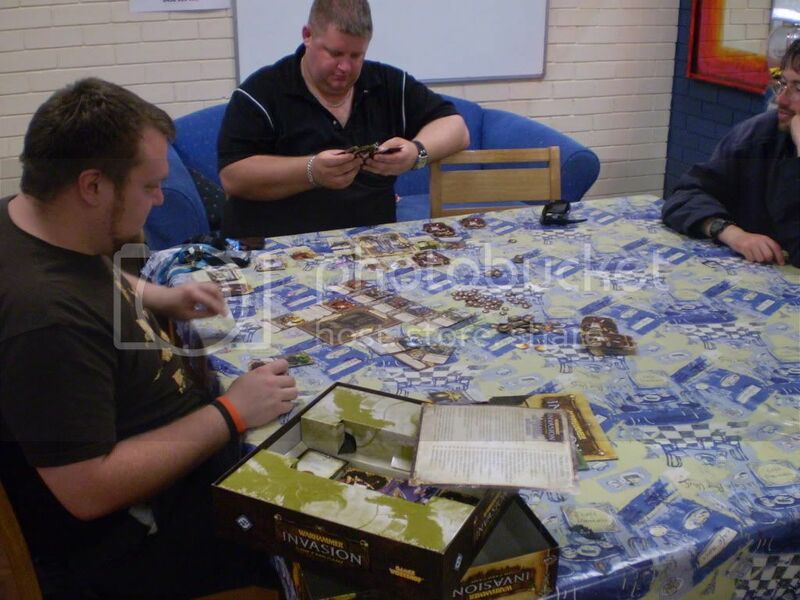 The current iteration started in 2004 as a proposal by the City of Mandurah's BDYC chief, Russell Trowbridge to start a gaming club to run regular role play and card gaming sessions. 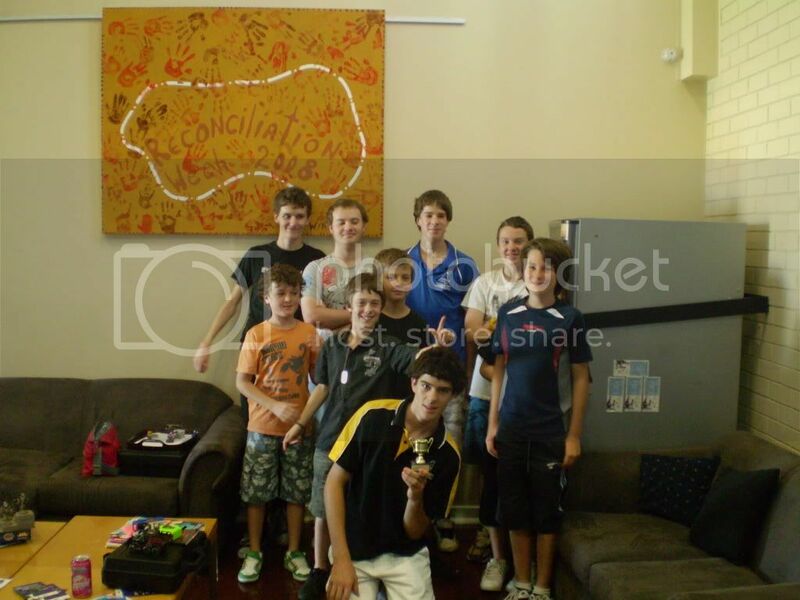 Russell had some experience starting smaller clubs in the northern suburbs and after relocating to Mandurah and taking over the BDYC, was looking to restart something similar here. He got in contact with my mum, who was the Mandurah Library's Youth Officer at the time and she put Russell in contact with me, figuring this was more my thing. Initially, PAGS was made up of just myself and three friends but with the City of Mandurah's backing, we started running demonstrations in the Centro Shopping Centre (formerly the Forum) on late night shopping nights just to try and attract attention. Long story short, it worked. PAGS meets every Monday night of the year (and very soon, the last Saturday of every month) at the Billy Dower Youth Centre on Dower Street in Mandurah, next to Rushton Park Oval and behind the Forum. We are open from 4.30 to 9.45. 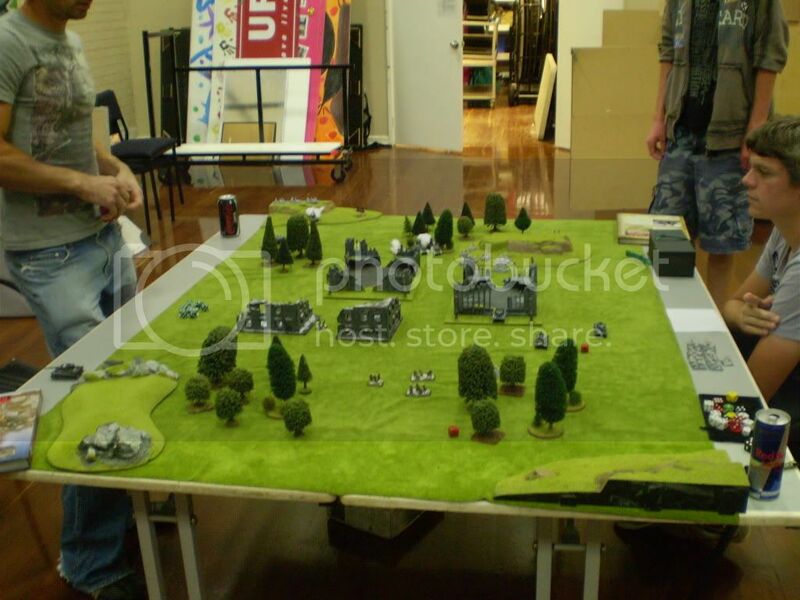 Primary tabletop games played are Flames of War, Blood Bowl, X-Wing & Dystopian Wars but our members have forces for Warmachine & Infinity as well. Our RPG groups play whatever they feel like running. 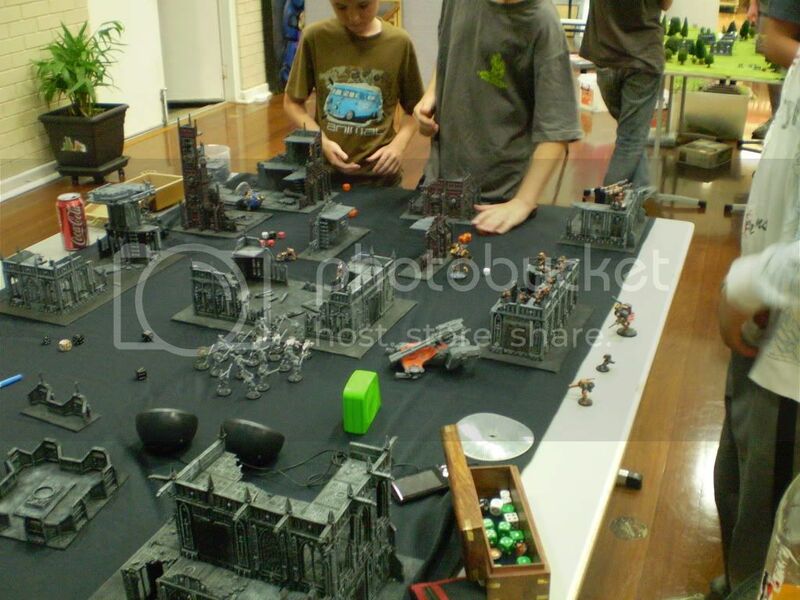 Right now, the under 18s are running a Dark Heresy campaign while the over 18s were last seen playing Star Wars. PAGS also runs it's own canteen and we cook dinner every night, usually serving around about 6pm. Dinner is always 5$, 6$ with a drink. We cook something different each week. Ok, I'm sold, what is it going to cost me? PAGS charges 3$ entry per night for non-Members and 1$ for Members. Membership costs 30$ a year and is calculated until the next 1st of August, at which point all Memberships expire and are due for renewal (so, it's 2.50$ a month until August, so if you were to sign up now (February), that would be six months until 1st of August (including the month you're in) and would cost you 15$). Club Westgamer members receive 50% off Membership costs. And who do I talk to? As of writing this, our committee consists of three people. Phil Adley is our Secretary, Liam Lucas (noddy) is our Treasurer and Daniel Etherington (Enigma) is currently President. I can be reached on 0401283924 or emailed at dave.glasson@westnet.com.au. On any given night, at least two of us will be at the Youth Centre. If you're looking for frequent updates, try the Facebook group here. Any rules I should know about? Our members and any attendees agree to follow a basic code of conduct. Most of these rules are common sense and involve staples like not running or fighting while inside the Youth Centre and not touching other people's property without permission. For occupational health and safety considerations, we also ask that all attendees wear closed in footwear. Our committee members all possess Working with Children checks and given the location and our insurance, we do not have a minimum age restriction on attendees. However, we tend to find anyone under the age of ten doesn't have a long enough attention span to enjoy the games without frustrating their opponent and those around them and ask that anyone under 16 usually be escorted. Once anyone under the age of 18 is at the Youth Centre, they are not allowed to leave unless escorted by a committee member, parent or guardian. We have had members mugged in the past right outside our doors and because of this, this rule is not negotiable. Forgive me, some of these are pretty old, some are pretty recent. Our main hall, in all it's glory. 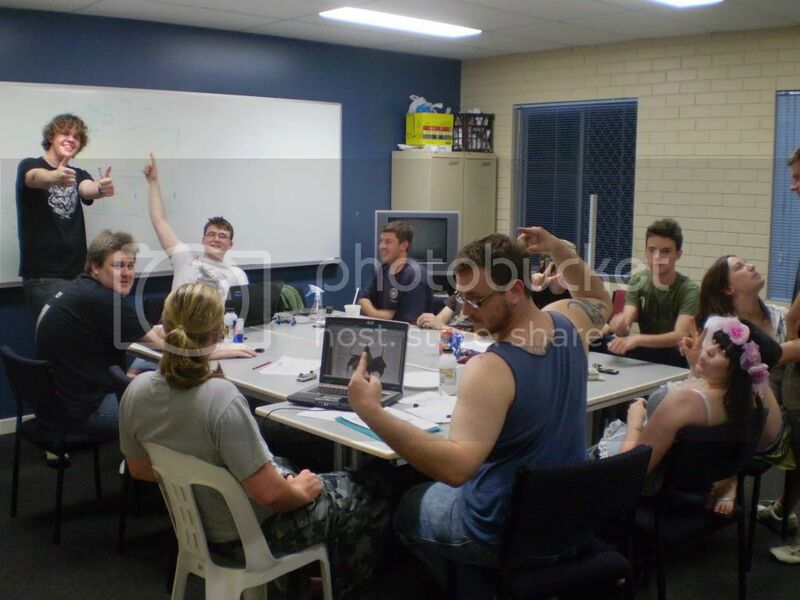 We also have additional rooms that are air-conditioned for running RPG sessions or board games. The boys giving Warhammer Invasion a go. 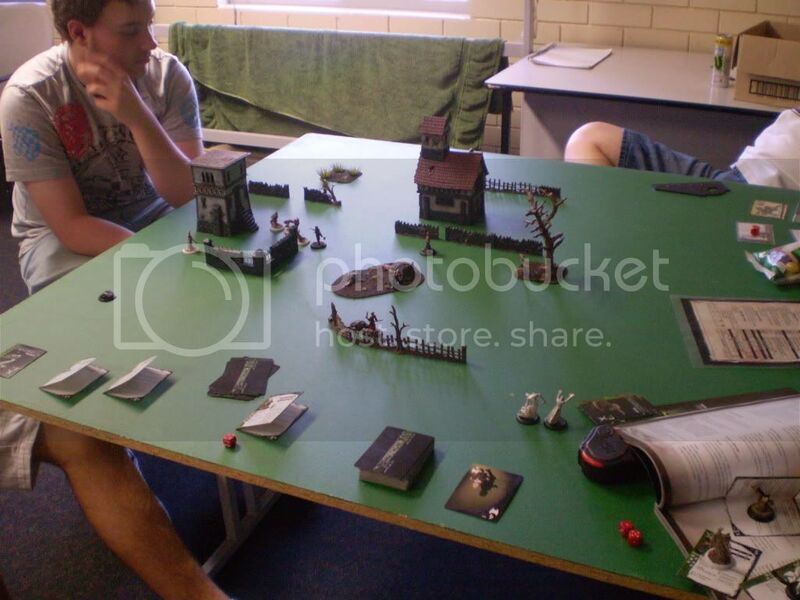 Taken during Rapid Fire 1, two of our young guys having a bash on one our Cities of Death boards. 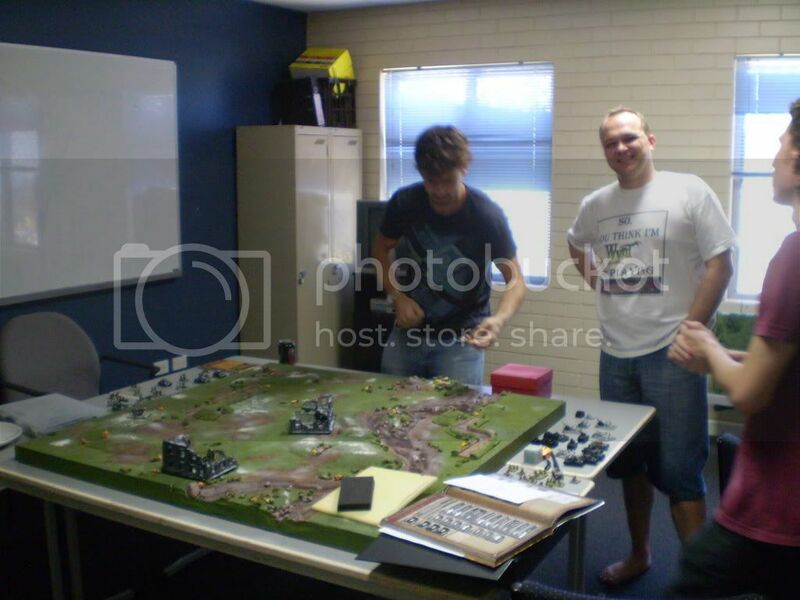 Mike Basc subtly sneaking in to a photo while Mike and Liam smash on with a game of Flames of War on Mike's own board. The only known photo of Matt Overton smiling. 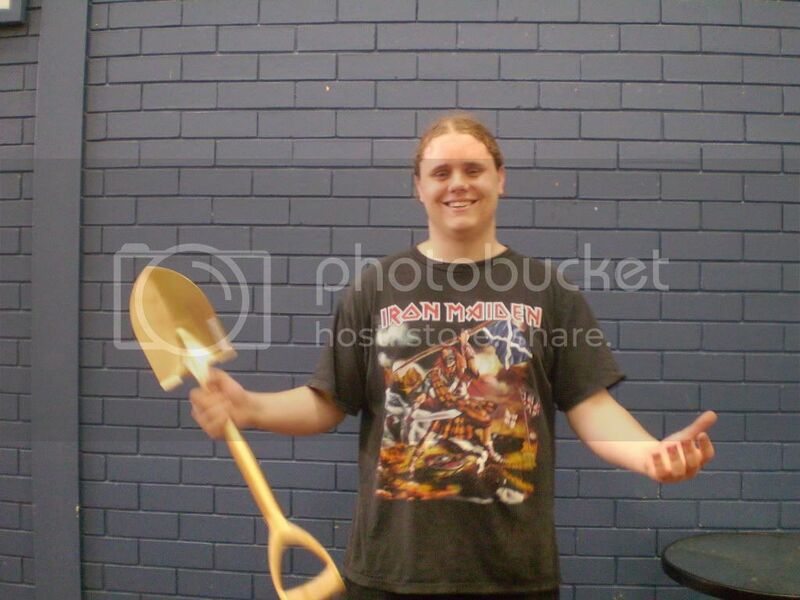 Taken after his win at our Warhammer Warbands "Goldiggaz" Tournament. FYI, that's the trophy he's holding. 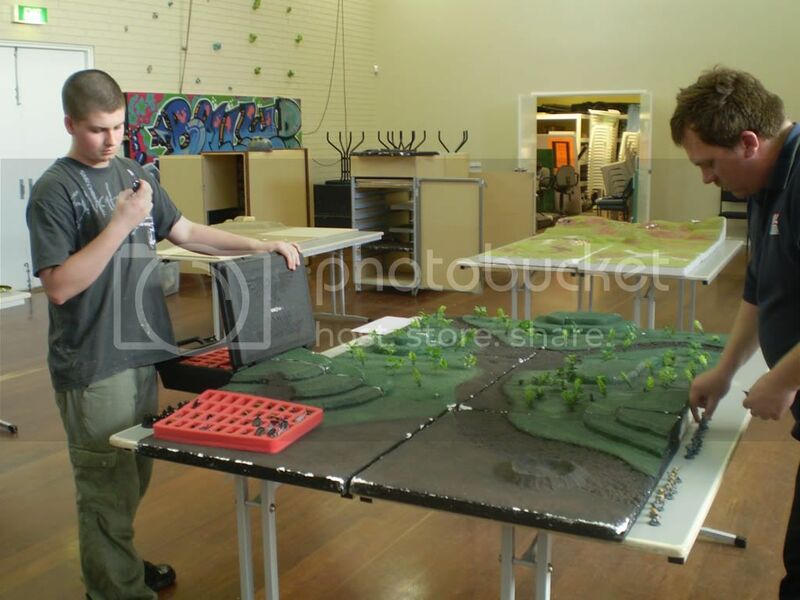 An old photo of Jared and Tim setting up for a game on our sadly deceased modular Jungle board. Alex watches on as Mike B confuses the hell out of me while teaching Malifaux. One of our two big RP groups. I'm pretty certain these guys are playing 4th Ed although it's often hard to tell. 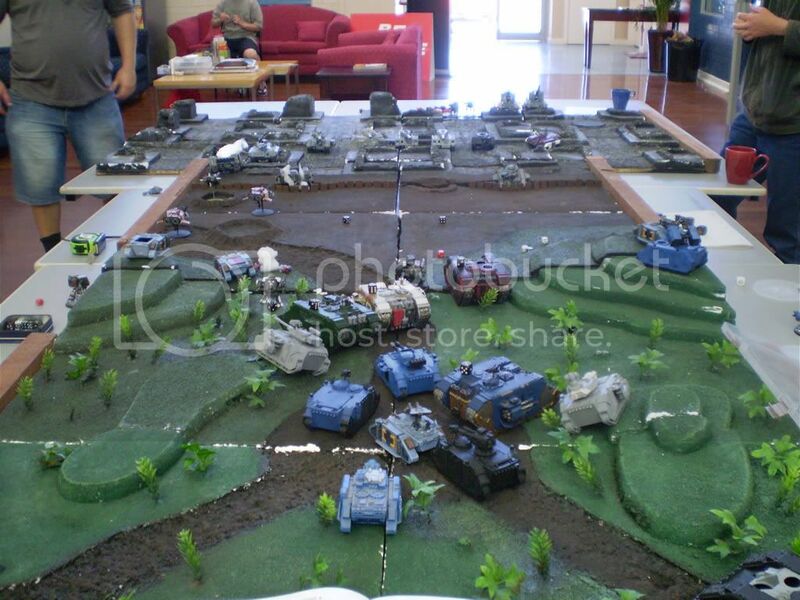 Another old photo of our Jungle boards, paired up over a no-man's land with our old CoD board. None of those Land Raiders made it out of the tree line. A 6000 point-a-side battle between Tim's Daemons and Paul's Marines on our recently repainted desert board with new rock formations. Our young guys at the end of Rapid Fire 2, with Owen triumphant! 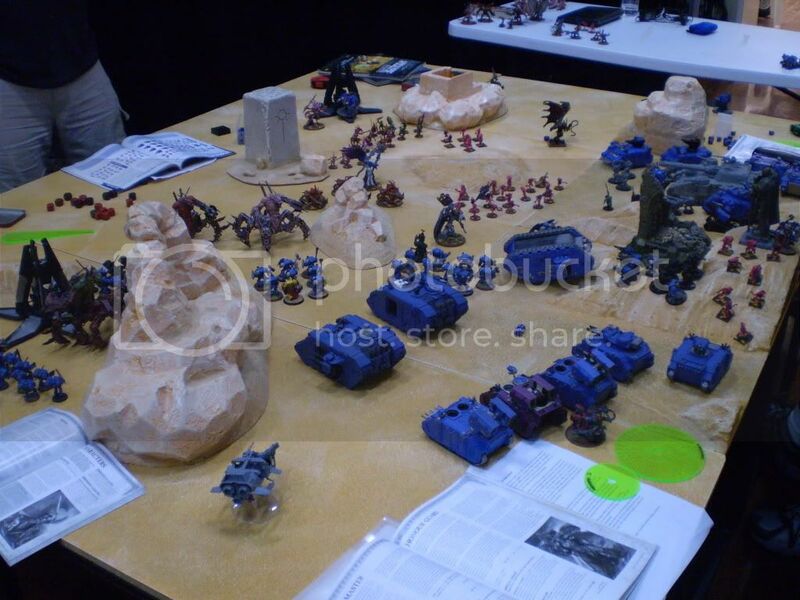 More Flames of War, using a mix of 40k terrain and Mike R's home made stuff.